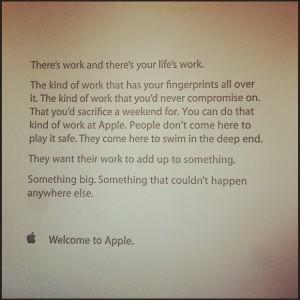 It is being reported on several techie websites that when employees arrive for their first day at Apple, they are given the inspirational note shown below. 1) First days are tough. You haven’t made “work friends” yet so you feel alone, you don’t know the company culture or jargon yet so you feel confused, and you are quite literally lost (“Where’s the coffee and bathroom?”). A warm letter can make you feel welcome. 2) First impressions count. A good orientation program helps, but a warm note shows that the company cares enough about you to think ahead to your arrival. 3) Cultural immersion should start early. First days—first weeks—often are periods of lighter workloads. It’s the perfect time for new hires to “work” on understanding the company culture and values. Having said that, there are two things wrong with Apple’s approach (note: so far, Apple has neither confirmed nor denied whether this letter is authentic) . First, it’s paternalistic. Slipping in, “The kind of work…you’d sacrifice a weekend for” sounds like they are setting the weekend hours expectation up front. If you’ve hired the right person, she’ll know that sometimes extra hours are required to get the job done. She’ll already have a work-life blend mindset. She won’t need to be reminded of that, and bringing it up on day one sets a bad, paternalistic tone. Second, it’s impersonal. The signature line has a pre-printed logo and “Welcome to Apple” statement. Not very warm. It would mean much more if the letter was actually signed by the CEO, or by the person’s manager, or even better, by every person in the department (talk about peer pressure!). Welcoming each newbie on their first day with a note is a great idea. To make it effective, make it personal and focused on organizational values.